Firefighters carry the restored statue of the infant Jesus that they saved from the wreckage a year before. The Shrine of Christ the King Church in Woodlawn held an event on Saturday morning to commemorate the anniversary of last year’s fire that severely damaged the historic building. The event began with an outdoor mass in the lot across East 64th Street, facing the church. An altar, a statue of the Virgin Mary, and the Shrine’s prized 17th-century figure of the infant Jesus were brought out to the lawn for worship. After mass, Reverend Canon Matthew Talarico led the group of more than 100 people across the street, where he delivered a speech recognizing the many people who had made it possible to save the Shrine. Among those recognized were the community groups who had rallied to save the church from demolition, including the Coalition to Save the Shrine, the nearby churches that had shared their space with the Shrine’s congregation, the Archdiocese of Chicago, and the firefighters who battled the blaze. Many of the historical societies involved with the initial campaign to save the church were also present at the event to pledge their continuing support of the Shrine. 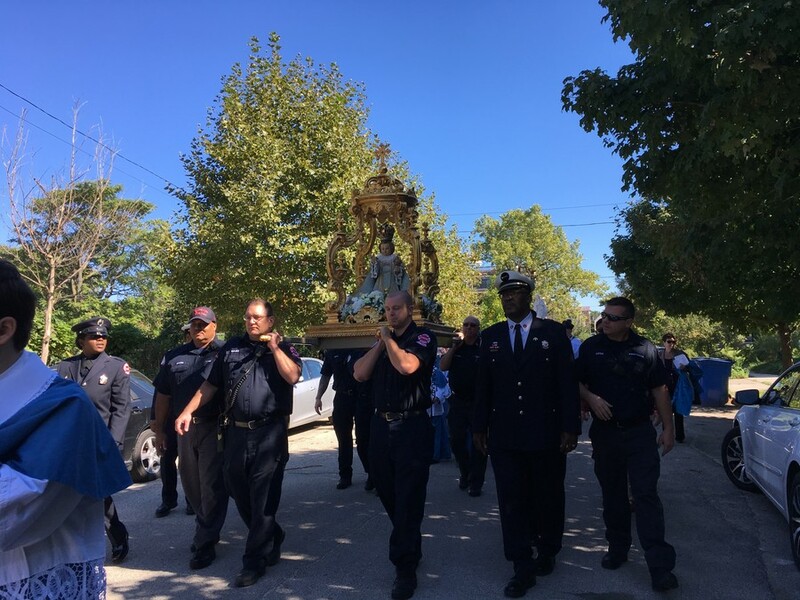 In the procession that followed the speech, the firefighters led the group around the block, carrying the restored statue of the infant Jesus that they had saved from the wreckage just a year before. Behind them was a group of church leaders leading the congregation in prayer and song while carrying the statue of Mary. Last October’s fire began when rags covered in wood stain were left out and spontaneously combusted overnight. The building, which was over 90 years old and the only Catholic church in Woodlawn, was declared unsafe after the roof, windows, and interior of the building suffered significant damage. In February, after months of negotiations, the Archdiocese deeded the property to The Institute of Christ the King, a national collection of Catholic churches. Since then, the Institute has been working alongside multiple historical preservation groups to stabilize and restore the church. The restoration process officially began in April when workers cleared rubble from inside the church and catalogued the damage. It was determined that the steel beams supporting the roof were unstable and would have to be replaced. These new beams will be made during the winter and installed next summer. This initial phase of the project, which will include stabilizing the facade and repairing the roof, will cost approximately $3 million. With over $1.5 million raised through crowdfunding and donations to date, the Shrine expects to secure large donations through several estates. At the event, church and community leaders emphasized the importance of community support and hope throughout the rebuilding process. “We thank God, as we pray for one another and for peace among all our fellow citizens, and [...] we ask God to bless our efforts to rebuild his home in the midst of our community,” Talarico said.